Welcome to Heavens To Betsy! Founded in 1998, Heavens To Betsy! is a unique line of earth-friendly, vintage inspired stationery products, including greeting cards, notecards, gift enclosure cards, notepads and journals. We take great pride in offering products which are made out of one of the most environmentally friendly papers in the industry, which is 100% recycled, acid-free and archival. All of our products are produced and printed in the USA. 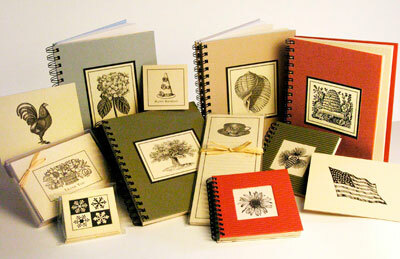 The designs in our stationery collections are inspired from vintage woodcuts and engravings. Choose from a wide variety of designs which include the Nature & Garden, Nautical, Animal, Holiday, Special Occasion, and Heavens To Betsy! Collections. Along with the great care that goes into designing and producing our stationery, all of our products are beautifully packaged to make an extra special gift! Heavens To Betsy! products have appeared in the following magazines: Country Home, Country Living Gardener, Victoria, Greetings Etc., Publishers Weekly, and Gifts & Decorative Accessories.